When I finished my first book, Rebuilt, I faced the question every first-time author faces: Now what? The question was especially acute for me because Rebuilt had been a lucky shot. When I suddenly lost all of my remaining hearing on July 7, 2001, a ready-made narrative dropped into my lap. There’s a lot of inherent drama in losing one’s hearing and getting it back with a cochlear implant. With a story like that, it wasn’t hard for me to find an agent and get a book contract. I was very lucky in a number of ways. I was lucky that there was a ready-made treatment at hand that really worked; my hearing is better with my cochlear implants than it ever was with the various hearing aids I had worn for 33 years. I was lucky that I lived ten minutes away from one of the country’s best cochlear implant clinics. And I was lucky in that the book gave me the chance to become the kind of writer that I had always dreamed of being. I had always made a living at the keyboard as a graduate student and as a writer of technical reports, but it wasn’t writing that nourished my soul. Rebuilt let me expand into writing about dazzling technologies and their effects on human relationships. When the book came out, it changed my life. It let me join a national conversation about technology and human values. I was invited to give talks all over the country and to write articles for my favorite magazines. In early 2005 I decided to quit my job and focus on doing that kind of work fulltime as a freelancer. Ever since, I have had the extraordinary privilege of conversing with people all over the country about where technology is taking us as a species. Naturally, I wanted to write a second book – but about what? Rebuilt had been an easy ticket, a free ride. Now I would have to work at finding a topic. One kind of story came immediately to mind. Shortly after Rebuilt came out I had started attending communications workshops. My dating life had always been rocky, a sore point discussed at length in Rebuilt. I didn’t feel confident about myself. I didn’t feel that I was good at establishing intimacy. I didn’t feel that I understood touch or body language. So when a trusted friend of mine told me that there as a school for learning how to become better at just such things, I gave it a try. My first class was full of new experiences. I was challenged to try things I’d never tried before. It was frankly edgy. I was wary of it being a cult. But the teachers came across as being gentle and nondirective. People were encouraged to decide where their boundaries were and to sit out exercises they didn’t feel comfortable doing. Dissent was welcomed and appreciated. After a while I began to relax and enjoy the ride. I signed up for more classes. For me it was amazing to discover that people could be systematically taught about communication, boundaries, self-awareness, body language, and touch. There was a great deal of structured talking and listening. There was also a great deal of structured touch in the workshops: hugs, face-touching, massage. It went radically against the habits of self-containment and restraint that are woven into Western culture. It pushed my buttons. But it gave me a sense of how I could learn to be a warmer, calmer, and more honest person. It was precisely what I needed. And my dating life began to flower. I asked myself: Could I write a book about this? I tried. I wrote a proposal for a book about my workshop experiences. But soon I realized it wouldn’t fly. It was too personally about me. It didn’t let me tap into issues of interest to society. 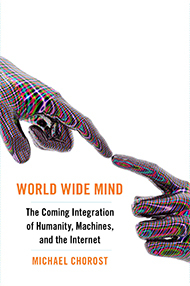 Around that time I came across Ramez Naam’s book More Than Human, in which he outlined the neuroscientist Rodolfo Llinás’s ideas for building a brain-computer interface. One could, Llinás suggested, thread thousands of tiny wires into the brain through the bloodstream. Each wire would end up in a capillary, where it could detect the electrical activity of a few neurons. With the right software, one could begin to deduce the brain’s consciousness experience by correlating it with what the person said and did. And by sending electrical pulses to the wires, one could in principle change the brain’s conscious experience. I was skeptical. What if the wires got tangled? What about blood clots? What if they poked through the capillary walls? But it made me realize that it was possible to imagine, in principle, building an incredibly intimate interface with the brain. And it began to dawn on me that perhaps our civilization desired just such a thing, even if that desire hadn’t been articulated. Many people have an intense, even addictive, relationship to their email and cellphones; the average teenager sends and receives 2,272 texts per month. Our civilization wants to be wired. Nanowires didn’t strike me as being feasible. But maybe other ways could be developed. In writing a feature for Wired I learned about an emerging technology named optogenetics, in which neurons could be genetically modified to start firing, or stop, in response to light. The technology is now giving researchers unprecedented control over neural activity. All of a sudden it is becoming feasible to see the neural basis of specific perceptions and memories. Finally I saw the connection: A new kind of intimate interface raises the possibility of new kinds of intimate relationships. Ways of knowing what another human being was seeing, feeling, and thinking in a kind of “telempathy.” And beyond that, ways of enabling humans to act collectively in ways that might constitute a higher-level intelligence – a World Wide Mind. Speculative ideas, of course, and very far from practical realization. But what excited me was that it was now possible to talk about them, and to do it concretely, in terms of technologies that now actually exist. I could take these ideas out of the realm of fantasy and write a “science fiction” in the best sense: a fiction that extrapolated from the known, instead of just making things up. And to connect that up with the humane goal of using technology to build a world in which human beings can connect more richly and authentically instead of less. I also aimed to develop a new style of writing about science. In most science books that have a personal angle, the storyline supplements the science without substantially adding to the argument. It usually adds color or shows the writer’s motivations in pursuing the science. But inWorld Wide Mind the argument is carried forward, tag-team, by the personal narrative and the scientific exposition. The book depends equally on both. There’s a lot going on in World Wide Mind. I hope you will read the book, and I hope you will enjoy the ride.